Earlier this month the Organization for Security and Cooperation in Europe (OSCE) held a “Human Dimension Roundtable” in Vienna. One of the participants — a Counterjihad sympathizer — has prepared the following report. Click the image above to see a full-sized map of the OSCE countries. At the bottom of this post is a list of those countries, as well as the mission statement of the OSCE. The original map of OSCE states (in pdf format) can be found here. Henrik Ræder Clausen has also posted a report on the same event. One may wonder what the Counterjihad and an organization like the OSCE could possibly have in common. Before I delve into this matter, I will provide a short overview of the OSCE, as it is a rather obscure organization, especially for non-Europeans, despite the membership of the United States and Canada. I will also touch on how the OSCE processes work. To be fair, the OSCE does its work in relative obscurity, “away from the headlines”, in order to defuse potential threats. The only time we hear about the OSCE is during elections, when monitoring missions are established, most recently in Georgia. The OSCE is also active in post-conflict areas, “helping to reinforce confidence- and security-building measures.” These measures include, among others, initiatives for minority rights, legislative reform, the rule of law, and press freedom. The OSCE, like the EU, believes in Euro-Mediterranean partnership which includes countries like Morocco, Tunisia, and Jordan for further cooperation. All partners for cooperation, save Israel, were noticeably absent from the roundtable discussions. The Organization traces its origins to the early 1970s, to the Helsinki Final Act and the creation of the Conference on Security and Co-operation in Europe (CSCE), which at the height of the Cold War served as an important multilateral forum for dialogue and negotiation between East and West. The fall of the Berlin Wall in 1989 and the collapse of the Soviet Union in 1991 heralded the start of a new era for a “Europe whole and free”, and the participating States called upon the CSCE to respond to the emerging challenges. The CSCE acquired its first permanent structures, including a Secretariat and institutions, and established the first field missions. In 1994 the CSCE, more than a conference, was renamed the Organization for Security and Co-operation in Europe. The very concept of freedom of movement for people, as established in the Helsinki Final Act, is what essentially facilitated the fall of Communism and marked the beginning of the end for bipolarism in Europe. What began in the early 1980’s in Poland with the mass protests of the Solidarity union, which was cracked down by the government, ended once again with Poland in 1988 the massive anti-government strikes forced the government to allow free elections in which the Communists were heavily defeated. These protests rapidly spread to other Soviet satellite states such as Hungary, East Germany, Czechoslovakia, Bulgaria, and Romania. By the end of 1991, Gorbachev had resigned and the Soviet Union had split up into separate republics. Communism was not defeated but had defeated itself. ODHIR organizes and hosts thematic roundtables to give civil society representatives the opportunity to draft recommendations for the OSCE and participating states. It is this consensus which was so extremely helpful in killing some “very poisonous” (Henrik R. Clausen) recommendations made at the Civil Society roundtable in July 2009. This is advantageous because if there is no consensus, then the recommendation is not carried and thus no longer an issue. Of course, this means only a very limited number of recommendations make it into the protocol. 4. Participating States are encouraged to actively create an atmosphere in the public space within which freedom of religion or belief can best flourish and in which religious and belief communities can engage in full and fruitful dialogue. This space should be open to all, and the public media can play an important role in the creation of this space. It should be noted that other than the official German representative to the OSCE, no participating state or organization except for ICLA, took the floor. A similar request was made during the Civil Society round-table meeting, namely for “sensitivity training in schools”, but this was quickly off the table thanks to ICLA and Pax Europa interjections. There should be no public funding for NGO groups as this would undermine the credibility of an NGO’s status as a non-governmental group. Other funding is acceptable, but it hard to understand the whining of Cojep regarding a supposed under-representation of Muslim NGOs. There were plenty of those present at the July 2009 meeting. The US Mission also quotes President Obama who “noted the importance for countries to avoid impeding their citizens from practicing religion in almost any way they see fit — for instance, by dictating what clothes a woman should wear.” As discussed by many commentators, this statement is truly poisonous when it comes to Islam. Though ICLA, Pax Europa, Mission Europa, and the Akademikerbund were invited to sign the Joint NGO Statement (Observatory for Religious Freedom, Spain; Alliance Defence Fund, United States et. al. ; Paneuropa Union, Austria; Human Rights Platform www.christianophobia.eu, Europe; Evangelischer Aufbruch, Germany), we were unable to do so. There are some acceptable ideas included in the statement; however, other statements contrary to our ideas were truly problematic, even if the intention is noble. Religious law must never be recognized as superior to secular law. This is where Muslims will applaud since this is precisely what Muslims believe: Sharia law is above any other law since it is Allah’s law. Thus, a clear “No” to religious law’s superiority to secular law. The idea that of granting the parents the unconditional right to moral and religious upbringing of their children unfortunately opens the door to Islamic madrassas, widely known to be breeding grounds for religious indoctrination and brainwashing. While this — the parents being in charge of their children’s moral upbringing — might be seen as good and moral idea, Muslim parents must first renounce the problematic verses and suras of the Quran (see Charter for Muslim Understanding). Freedom of religion and freedom of assembly are complementary rights, with the former requiring the latter for actualization, maturation and perpetuation. A disturbing trend exists where laws regarding the establishment of places of worship for minority Christian religions are either illusory (because of administrative provisions making the operative provisions of laws allowing for the establishment of places of worship virtually impossible to utilize) such as in Turkey, or are non-existent such as in several of the more conservative Middle Eastern Nations (e.g. United Arab Emirates and Saudi Arabia). FREEDOM OF SPEECH is the foundation and basis of success of every democracy. It is the basis of the dignity of the human being. The loss of the freedom of speech is the beginning of tyranny, as history proves. It is being severely threatened in the EU in our day by so-called Hate Speech and Antidiscrimination legislation. In Europe we observe that Muslims have been increasingly facing arbitrary and discriminatory restrictions on their right to manifest and practice their religions. The referendum process to ban the building of minarets in Switzerland and the recent law adopted for the same purpose in the Carinthia province of Austria are two examples of this worrying situation. Muslims are also concerned about intervention of their internal religious affairs, especially when they were not allowed to choose their own imams or muftis. We would like to also recommend that ODIHR’s Panel of Experts on Religious Freedom should have a more balanced approach towards to all regions of OSCE and all religious groups and believers and non-believers. For this purpose, we would like to propose to ODIHR to include at least one expert with a Muslim minority background. The ban on hijabs limits the ability of women to get education and employment and indirectly discriminates against women. In Tajikistan, where the economic status of women is lower than that of men, the ban on hijabs should be lifted. Radical political correctness and hate speech legislation may lead to a restriction of the freedom of religion as well as of the freedom of expression. We urge not to promote a claimed right not to feel offended which ends up in restricting the freedom of expression of individuals and groups, including religious individuals and groups. The ODIHR should not consider violations of religious freedom against majority religions less serious than those against minority religions because such violations are serious per se and OSCE commitments are referred to majority religions as well. ECRI considers that religious intolerance is a form of racism. ECRI has taken issue with various forms of intolerance: harassment by the police and local authorities vis-à-vis, among others, “non-traditional” groups; violence against persons and properties perpetrated by non-state actors; and inflammatory speech by extremist politicians and media. ECRI has also commented on the spreading of stereotypes and prejudice (on, for example, the limited possibilities of some religious groups to integrate); and even the contribution to the negative climate of the exploitation by mainstream politicians of issues such as forced marriages and female genital mutilation. For ECRI there is no real dilemma between protecting freedom of speech and the fight against religious intolerance. There are cases where the demands of the latter will take precedence over the former. It should be noted in this respect that the Additional Protocol to the Council of Europe Cybercrime Convention takes to some extent the same position. In its General Policy Recommendation on combating racism and racial discrimination in and through school education, ECRI has highlighted the need for an instruction which “complies with the scientific neutrality essential in any educational approach”. ECRI has had to deal with religious discrimination in employment and housing. This targets, among others, women with headscarves. Dialogue between the authorities and the representatives of religious groups but also between the different groups is essential in a multicultural society; also essential is the monitoring of the situation by the authorities, through a process of data collection that respects the principles of data protection and self-identification. However, multiculturalism should not be seen as an end in itself. What ECRI strives for is integrated societies. For us, successful integration is a two-way process, a process of mutual recognition, which has nothing to do with assimilation. An “integrated society” in ECRI’s conception is equally inclusive of majority and minority groups. Ambassador Babacar Ba spoke on behalf of the Secretary General of the Islamic Conference, Abdelouahed Belkeziz, emphasizing the significance of Islam in the history of humanity and the values of tolerance and freedom it has always promoted, whilst denouncing the link between Islam and the 11 September 2001 terrorist attacks. Ambassador Ba stressed the positive relations between Islam and other religions, recalling how, historically, Islam had harmoniously integrated certain elements of previous civilizations. He made a link with the Mediterranean aspect of the Rome Conference by underlining the crucial role of the Mediterranean area in the symbiotic relationship between Europe and Islam. Quoting two verses of the Koran, Ambassador Ba underscored the openness of Islam. According to him, Islam has always been a good example of tolerance towards the Jews, the Christians and also nonbelievers throughout history, whilst discouraging forced conversion. Ambassador Ba went on clarify the alleged misunderstandings pertaining to the debate on the compatibility of religion with democracy. According to him, Islam is not less compatible with democracy than other religions, pointing to the notion that the West did not inherit its democratic principles from any religion, but rather from its great philosophers. Moreover, he argued that the Islamic world is following the same path as the West by striving to institutionalize the same separation of religious institutions from the state. He emphasized the OIC’s commitment to the dialogue between cultures and civilizations in all its relations with international organizations, mentioning an initiative called the “civilization dialogue”. We must, under all circumstances, continue what was started in July 2009. We need to shake up and wake up those willing to wake up. Perhaps one day we will be able to say: The CSCE brought down communism; the OSCE brought down Islamic supremacism. The OSCE works for early warning, conflict prevention, crisis management and post-conflict rehabilitation. The Organization comprises 56 participating States that span the globe, encompassing three continents — North America, Europe and Asia — and more than a billion people. Europe faces new threats and challenges. The OSCE, with its multi-faceted approach to security, offers the region a forum for political dialogue and negotiations and a platform for multilateral partnerships that pursue practical work on the ground. Dialogue is in the OSCE’s genetic code. To maintain security throughout its region, the OSCE relies on political dialogue about shared values and develops partnerships with governments, civil society and the private sector. 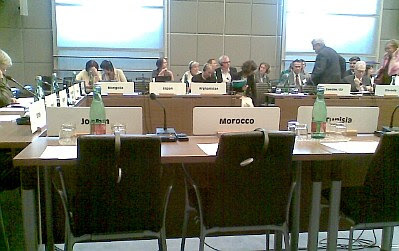 The OSCE often works away from the headlines to foster discussion to defuse tensions and head off potential conflict. The OSCE’s 19 field operations enable the Organization to tackle crises should they arise, and can also play a critical post-conflict role, helping to reinforce confidence- and security-building measures. They foster the administrative capacity of the host countries through concrete projects that respond to people and their needs. These include initiatives to support community policing, minority rights, legislative reform, rule of law, press freedom and border management. Increasingly, the OSCE is building networks of professionals to work more efficiently against terrorism, smuggling of small arms and light weapons, and trafficking in human beings. The complex security challenges of the 21st century — from climate change to the spectre of terrorism — have made it clear that the co-operation fostered by the OSCE is needed more than ever. These combine with the challenges inherited from the past — resolving conflicts in the former Soviet Union, embedding stability in the Balkans, promoting military transparency — to make the OSCE agenda ambitious and full.